Had to make a quick birthday card last night so I turned to the new Artfully Sent cartridge. I saw a card that inspired me on Pinterest and knew what I wanted to do so I didn't use the cards as they were on the cartridge. Instead I took part of one of the swing cards (the piece with the candles). They candles were cutout and I put patterned paper behind the candles and gold shimmer trim behind the flames. After it was all decorated, I added liquid glass to give the candles and flames some dimension. The paper is from Confetti Wishes and I embossed the background with CTMH's Woodgrain Embossing folder. It turned out cute I think! It's only the beginning... there is so much on this cartridge.... back to my papercrafting playground! 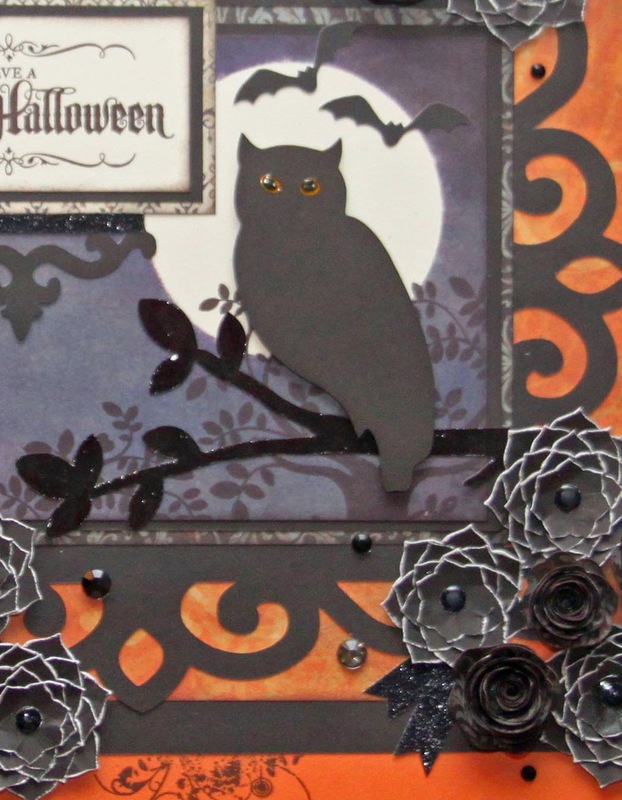 If you will remember, last week I posted a Halloween shadow box page that I created. This is the idea I had in my head when I started that project....lol! I don't know what happened but I guess the tree was smaller than I had pictured and it wasn't working on the scale that I stamped the moon and tree so it turned into something else. After a lot of playing this week I finally got my idea out of my head. The black background is embossed using the CTMH Arrows Embossing Folder. I created the moon by masking off a circle on the colonial white and then sponging on colors from light blue to purple to gray to a touch of black. I tried to make it darker the further away from the circle I got. The owls from "Owls" were stamped on black, cut out and mounted backwards so that the stamped image can't be seen at all... they have their backs to us afterall. The ribbons were cut from the Cricut using the CTMH Artiste cartridge and colonial white cardstock with washi tape over it. I also covered a white button with the chevron washi tape. I liquid glassed the tree from Family is Forever, added a bunch of enamel hearts, stamped images from #30YearsofHappy, and Holiday Tags to hold the sentiment. Now I can continue on with my papercrafting life. So... when I started this project it was going to be a card and it was going to be an I Love You card. I've had an idea for the Family is Forever SOTM and when I executed it, the idea morphed into something completely different. I decided it lent itself to Halloween more than anything, but I don't send Halloween cards... so it grew and grew until I decided it would make a nice decoration to go in my seasonal shadow box frame. The New Cartridge is Here! The New Cartridge is Here! Finally ready and available to order!! Get the new Artfully Sent cartridge set including coordinating stamp sets today! You can order from my Close to My Heart website at http://bzscrapper.ctmh.com﻿ or if you have questions please don't hesitate to contact me! These little cuties are from one of CTMH's special Hostess Stamp sets available at a special low price only to hostesses when they have a gathering or workshop. This great set has it's own sentiments, but I used some of the sentiments from September's special stamp set #30YearsofHappy and they went really well together... even more options! The paper is from the Whimsy Paper Fundamentals. I just love these papers because they are so versatile and can coordinate with all of the CTMH papers! Mix and Match is my favorite thing. I colored these characters with the Shin Han markers and sponged the bottom with stamp pad ink and added a mixture of embellishments. These 3x3 notecards will make great additions to gifts or cute just by themselves when you want to remind someone that you are thinking of them always. Three Amigos Mini Blog Hop-September! There. There it is. Doesn't look like much, does it. Let me stop here and thank Susan Fogle, one of my Amigos, for Facetime Scrapping with me over the weekend and teaching me how to make one of these Pop-Up Box Cards (I prefer to call it an Explosion Card). I have sooo many ideas for this style card. I used the fantastic Paper Fundamentals Whimsy paper pack.... I LOVE these papers... little bit of gloss; little bit of pattern; little bit of embossing. I used the artbooking cartridge to cut out the sentiment frame, word bubbles, stars and fireworks. I wrapped some washi tape around sticks I had in my drawer and made little flags with another pattern of washi tape. I used the twist ties and twisted them in spirals... once I got going this was so much fun! Mine doesn't hide nicely inside of the card, but hey!... once I started I couldn't stop.... I'm still not sure I'm done...lol! And those cute little stamps from the special were a perfect addition. So... finish your short hop (there are only three stops on this one) by checking out Donna's project this month! Thanks for stopping by! So here we are in September! Can't believe the Summer is winding down... (although here in Arizona, there is lots of Summer left!) This card was made using the September Stamp of the Month "Family is Forever". I struggled with using this set at first, however, as I'm seeing more and more artwork done with it I have seen how versatile it can be for both cardmaking and scrapbooking. I also used September's special stamp set, #30 Years of Happy. You'll see more of this one in our Three Amigos Mini Blog Hop on the 3rd. I couldn't help myself-had to add the owls and this one slowly became the anniversary card I will give to my husband. Don't judge... I couldn't go Cold Turkey on the Owls after last month's whirlwind! The paper is Pathfinding, the tree and flowers are from Family is Forever. I used the Shin Han markers to add more detail to the tree and make the leaves look autumny (word? it is now!). I used the Red Enamel Hearts and Bronze Shimmer Trim. For the center of the flowers I punched circles from the shimmer trim and then added liquid glass in a bubble. I like the way it turned out. Those owls are from an old Petite Perks set that I know some of you have. Under the tree I just sponged some fall colors to give the feeling of an autumn woodland floor. I'll be posting more pics during the month with this stamp set along with some of the other great stamps and products CTMH has to offer. If you love "Family is Forever", you can get it this month for only $5 when you spend $50 on other products. (Also, don't forget the September special which is free with $30 of stamp sets from the current Idea Book!). Check back in a couple days for the hop!